Description: The dark end of downtown, home to a assortment of adult entertainment venues and more than a few shady characters. 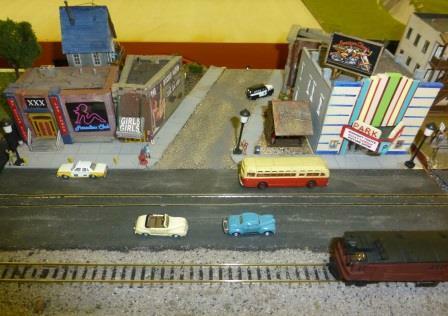 This module is one of a set of downtown settings that host a third track for a street-running trolley. Lots of action in every corner, and plenty of interesting ladies in the "entertainment" industry. And just to ensure that you don't get off on the wrong streetcar stop, there are plenty of flashing signs to let you know what you are getting into.